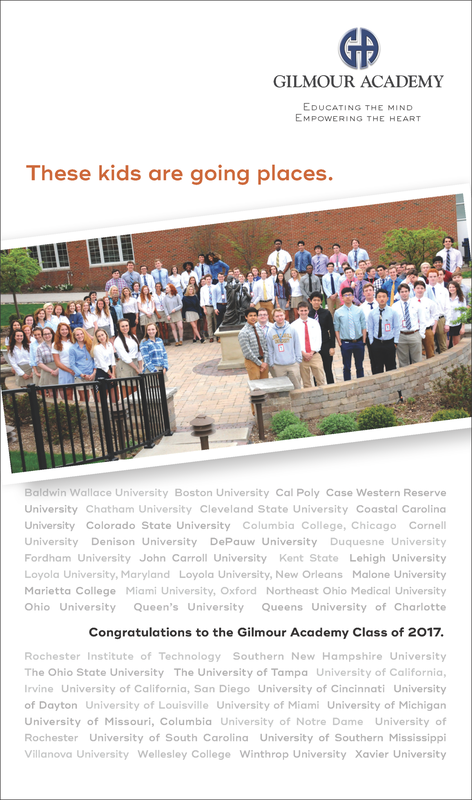 This Sunday, May 28, at 11 a.m. Gilmour will present diplomas to 101 students who plan to attend such colleges as Cornell, the University of Michigan, Ohio State, the University of Notre Dame, Cal Polytechnic, Boston University and many other schools across the country. Nupur Goel ’17 is the class valedictorian and will begin the accelerated BS/MD program at Northeast Ohio Medical College in the fall. Michelle Moufawad ’17 is the class salutatorian and will study biology and Spanish at the University of Notre Dame.